There have been a lot of things going on since my last post to this bog. I'll try to make things clear through a few posts. 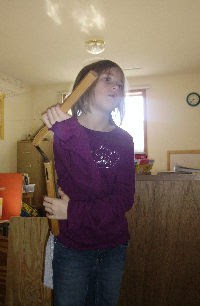 I try to practice the various weapons and arts of self-defense that I've learned through my life. Clara and Sophie were particularly interested in practicing the Nunchaku. 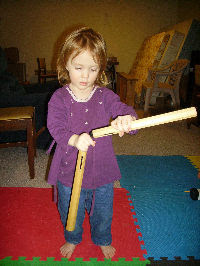 Clara did well in passing the Nunchaku over her shoulder. Stella, well, she's only 3 years old. But she did very well when she worked at the over hand pass. Let Pr. Schmidt's boys beware of my daughters! They will know how to handle themselves in any case of need. Steve and Sarah, let your sons know that my girls are prepared for anything physical! Your sons will have to woo my daughters with true, Christ centered affection if they want to have any hopes of surviving courtship. In our telephone conversations when one of our girls have answered the phone, Pr. Schmidt has teased our daughters as if they were daughters-in-law. They have no problem teasing him back. So, it has been a very busy week with lots of hospitalizations. Baby Nolan L. went into the hospital Sunday with RSV. I baptized him three months ago. After an uncomfortable time for him and his folks, prodding nurses, nebulizer treatments, O2, and such, he was able to go home on Thursday, I think. Milan R. was taken to the hospital by ambulance on Tuesday with some kind of internal bleeding. They found an ulcer on Tues eve. He was flown to Fargo on Friday. Oskar N. was hospitalized Sunday with some kind of infection that caused his memory to fail. He was released Tuesday evening. Darrow L. was hospitalized the past weekend. The previous week he had undergone the torment of the tests and procedures for his first chemotherapy. He has a bad burn on his arm from the chemo. Anyway, something caused his white cell count to go way down. So he was put in a sterile isolation room to prevent him from contracting any other infections in his weakened state. He was able to go home on Wed. But he was back in the hospital Friday because the burn on his arm was getting infected. He might get out on Saturday (tomorrow). The arm looked much better today, he looked pretty good. There were a couple of other hospitalizations of other members, but they want privacy. Please keep these members and their families in your prayers. Monday Mary and I brought our van down to Clearbrook to have the front end looked at. Mary ditched the van last winter and the front end was rebuilt. It's been making some noise so we had it checked out. Thursday morning we went down to get it. Jeff guarantees his work. He fixed up what was wrong and wouldn't take a cent from us. Thank you, Jeff. Now, there were several other things going on too. But I'll have to put them in subsequent posts. Nancy, I'll get you the hymns for lent and beyond sometime today. Last night I separated the whey from the cream-cheese. I used some of the whey to make kimchee. We ate the milk solids that floated on the top of the whey. I put it out as a topping for our hush-puppies with a little oregano. That was good. There was only about 3Tbs of milk solids floating on the top, so we all shared. After getting about a quart of whey off the cream cheese I tied the dishtowel and hung the bag. A few hours later I had another quart of whey. And the bag was dripping slowly. I bottled that quart and set a bowl under the bag for the night. Today I packed about a pint of cream-cheese into glass containers. Man, it is good. I also took the most cloudy quart of whey and brought it to a boil, added a bit of salt, vinegar, and basil. During this process Louisa and some of the kids thought the whole thing smelled like puke. Then I put it through a coffee-filter. The solids left behind are ricotta (reboiled) cheese. There was about 1/3 c of this ricotta. We gobbled it up for noon meal today. Laura, thanks for the milk and the directions. Sorry, no photos this entry. Sunday we had 27 below zero F temperatures. Nazareth canceled church, Oak Park canceled church. St. Petri had late service, and it warmed up to a toasty 17 below by that time. So we had church and a dinner, and annual meetings. Matthew came with me. Roland K. said he had a lot of Jack Rabbits, so Matthew and I made note to stop by his place before the season ended. We got home around 3pm. I had to unplug a toilet, thanks, Stella. Monday, Winkel-the circuit 8 pastors met here at Oak Park. All but one of the pastors could make the meeting. Mary made pork loin chops and potatoes for noon meal. All very yummy. I put out Frieda's Kimchee. It's not as good as Sanjay. And neither are as good as my homemade kimchee. Which reminds me: I have to make some tomorrow (Wed). For supper the pastors that could went out for a dinner at the Evergreen in Thief River Falls. The food was great, and they understand about Gluten-free diets. Matthew and Louisa baby-sat the other pastor's children at our parsonage. The dinner was a wonderful time of friendship and stories and food. Again, I had to unplug a toilet; thanks, Stella. Tuesday: This is my day off on Winkel weeks. Usually I take Mondays off. So, how did I spend this day off? I did relax: A Lot! I read. But I left home at 4:45pm to go to Lancaster for a 6:30 class. It was a DNR class for Volunteer Firearms Instructors. I'd never been to Lancaster before. And by the time I passed Karlstad I was almost getting a nosebleed from the high latitude. And frostbite was starting to set in because my car's heater couldn't keep up with the ambient temperature of 17 below at 55 mph. The course went until 10:30pm. I was the student who traveled the furthest. But I have to give the instructor some great credit. 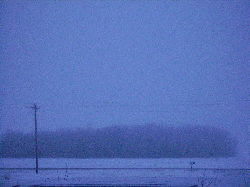 He came from Remer, MN (east of Leech Lake). The course was good. I have to pass a criminal background check (which I've passed 6 times in the past 4 months for other reasons) and, hopefully, I can be certified as a DNR qualified Volunteer Firearms Safety Instructor. One of the reasons I took this course was our annual Clearwater Youthgroup Shootout. I want to be more competent in what takes place in instructing our youth groups and their guests. Another reason is that I greatly appreciate our 2nd Amendment rights and hope to promote that appreciation to the next generations. So figure this day off as an exercise in my American Citizenship. 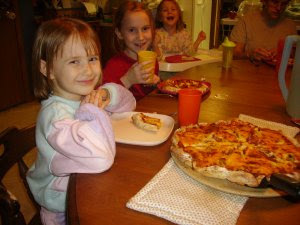 Sophie wanted pizza for her birthday dinner. Not just any pizza, but personalized to each eater. Matthew whipped up enough dough to make a bunch of gluten-free pizzas. 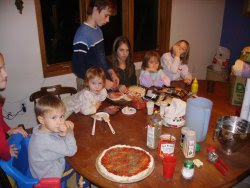 And the kids had fun putting the toppings on their own pizzas. So the party started with food preparation. By now, we can make a great pizza sauce from scratch. Matthew's dough was great. He tried tasting a bit of Xanthan Gum (an ingredient we use to duplicate the sticky nature of gluten) and it stuck to his teeth. Sophie looked pleased with the meal. And this photo melts my heart. I am such a softie. I can't describe how much joy fills my heart to see Sophie, Elsie and Stella smiling like this during Sophie's birthday dinner. Actually, I have a problem. I love kids. At the last convention of our Synod (the ELS) an older pastor and friend asked me about my family. He was suprised to hear that we had 8 children with one on the way at the time. "Do you know what's causing this?" he asked, jokingly. "Yes, I do" I replied, "But it's so fun." "It sure is" he said. I replied, "But I meant raising children." He did a double take and laughed a wholesome and hardy laugh. But I mean what I said to that retired pastor. I love my kids. I love making them happy. And as frustrating as it can be, I love teaching them to be responsible adults. Well, at dessert it was time for the birthday cake. I took photos rapid fire as I do at each birthday. 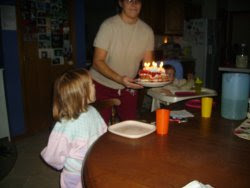 I hope to get an action shot of which-ever child in the act of blowing out the candles. Sophie was so fast and had such lung power that her candles were out almost before the cake hit the table and we had finished singing the last line: "Happy birthday to you." Sophie wanted shortbread cake with strawberries. Mary made a gluten-free recipe. It was great. But--irony of ironies--Sophie thought it was too sweet. One thing is very consistent with Sophie, she hates her vitamins. She gets a children's multivitamin and an extra chewable vitamin C each supper time. She said she likes her vitamins a bit more than her birthday cake. I think we'll keep a slice of her birthday cake frozen for the times that she doesn't want to swallow her vitamins!!!! Sophie says "Thank You!" to all her relatives that sent gifts, especially: Char and Dave, and her Grandparents. 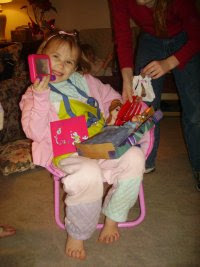 She's sitting in a chair that was a gift, wearing a gardening apron and all the gardening apparatus that were gifts, holding Barbies and other gifts. Elsie is trying to keep the gifts from falling off her lap. Sophie enjoyed her 6th birthday. She was the first of our kids who was born up here in this parish. After her were John (at the time also when by brother died), Stella (who now has a fascination with toilets), and Donna (who has just started to be able to sit up). 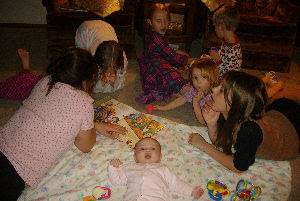 So, I bring a practical question of parenting to the readers. I'd like to be able to magically change Stella, hypnotize her or something. In the past 7 days I have pulled several hair doo-dads, a comb, a bracelet, a necklace, and a few other things out of the main toilet in our house. A few days ago, something got past all of us, and Stella's deposit in the main bathroom caused the toilet to plug. I bought a toilet screw and cleared the blockage. Today she put one of my camera's 1GB memory cards in the mudroom bathroom toilet. AAAAHHHGGGHHH! Thankfully the memory card is a small SD card and didn't plug up the system. What an expensive kid! Remember the Whinne the Pooh post on my 41st birthday? Everyone here is on alert for Stella's dive bomb toilet deposits. 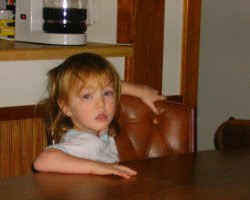 If you have advice on how to teach a 3 year-old her responsibilities in this matter, please tell us. This is a new diversion for us. 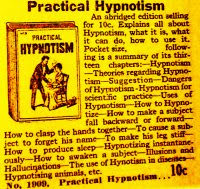 If only I could hypnotize her not to do this. I have a couple of daughters who are waaaaayy too sensitive to what they might think other people would think about them if they looked uncool for a moment. 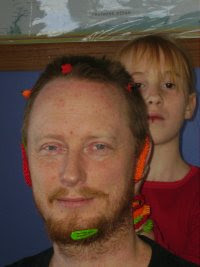 So, this morning, Sophie's birthday, Elsie decided that my hair was long enough to decorate. It started out as a shoulder rub, but then out came the girl power hair-doodads. So, girls, is this an embarrassing enough photo of your dad to show you that he's not trying to make you feel bad, but just trying to teach you to enjoy silliness from time to time? Car wouldn't start this morning. Church at Mt. Olive was called off last night due to the extreme cold. Indoor recreation was the best idea, since noses froze in 3 minutes at -27F outside. Louisa gave me a haircut after this. Matt finished the cut off by getting rid of most of the tufts. We still had to go out this afternoon to the grocery store in Oklee for a few things for monday. And I went to Jaime and Laura's to get some whey so I could make a batch of Kimchee. They are so nice. They taught me how to make my own. "I'm going to teach you how to fish" said Laura. She definitely didn't mean that she didn't want our family visiting theirs again. And she gave me some raw milk as a starter. In a few days we should have some whey and some cream cheese. I took Louisa and Elsie with me. But they didn't want to go home. "It's Sophie's birthday party when we get home!" They came. A mile north of their place we saw a UFO. It didn't swoop down and give us a chicklet (Bill Cosbey fans). And, of course, it was too dark to get a good photo. The spot in the middle of this photo is the UFO. I used the night photo setting on my camera to get this. It really wasn't this light. I took a dozen photos and this was the pathetic best. I think someone by Red Lake Falls was out in a hot air balloon this evening. I can't figure out why someone would pick an evening when the temperature was -20F and lower. Maybe it made for good lift with the burner. But since there are so many Texans this week who saw a UFO I thought I'd put up my own UFO. Ha! Off to Sophie's birthday party. Tomorrow (actually it was today, I'm pre-dating this post by one day) is Sophie's birthday. I'll put up some photos and comments about her birthday. Sometimes being a pastor is an extremely hard thing to do. It's hard because of love. Being a pastor is holding an office, just like a sheriff, deputy, police officer, or judge. I picked these "law enforcement" titles because it's easy for me to imagine that a deputy or police officer has to respond some time or another to a household of friends and family. A judge might have to preside over a a terrible case where he knows the perp and the victim as friend or family. But, the judge can recuse himself, and the police officer or deputy might also be able to recuse himself because of this conflict of interest. The pastor cannot recuse himself. Love is a wonderful thing. But it carries great responsibility. I love my wife, I'm very much in love with her. I love my children, except for the fact that some of them are growing older and would be embarrassed by me, I could hold and cuddle, make faces at them, tickle them, and enjoy them until my back gave out. I love my congregations and many of the members have become like family to me. Our kids play together, we drink each other's coffee, spend time at each other's home. Love demands that when I do wrong, my wife or kids do wrong, that we confront each other about it. It can be very difficult, very painful, but because we love each other we need to tell each other about our sins in order to bring about repentance, confession before God, and forgiveness. Hopefully, by God's grace, the behavior will change too. But as parents know, the change may be a long time in coming. Love demands that when my congregation members sin, many of them being friends and like family as well, that I --as their pastor-- need to confront them. Again, it is painful, and difficult. But the goal is forgiveness and eternal life in Christ. Love sometimes places demands upon us that we can never meet, both because of circumstance and our own pathetic sinful natures. We've had to cancel church at Mt. Olive on Sat. because it was dangerously cold (-27F Sat. morning). Nazareth and Oak Park have canceled for Sunday morning for the same reason. St. Petri has late service, and hopefully my garage will be warm enough for my car to start later in the morning. I hate missing services because of weather. I hate missing shut-in calls because some of my family are sick and I don't want a frail shut-in to get whatever-it-is from me. But this post isn't about canceling church. It's about not being able to get to members who need the means of grace in time of great trouble. One shut-in, Lyle, has been recently moved to a memory ward at a nursing home, but he is having some medical difficulties. And these difficulties have caused great stress and need for his wife, family, and friends. Please keep them in your prayers. Darrow, who had an optimistic diagnosis for cancer, has had a turn for the worse. We were over to his place shooting squirrel last Friday, today he's in the hospital fighting for his life having toxic chemicals poured through his system in the hopes that the chemicals will kill the cancer before they kill him. Please keep Darrow and his family in your prayers. Both of these people are family, Lyle's and Darrow's wives are sisters. Some of their grandchildren will learn about their situations through this post. For those members, please call me at the church number. I'll be at St. Petri from 10am to 2pm. But I'll be home the other times of the day. Love can be so demanding. I don't know whether to go to Darrow and his family in Rochester, or to Lyle and his family here. I do know that I have a worship service in the cold tomorrow. And, God willing, I will be there. I want to thank Pastor Rank for being willing to go visit Darrow and his family in Rochester. Tom, God bless you, and thanks. It is such a blessed relief to know that they will have the means of grace during this time of trouble and trial. Love can be very painful at times. As I've said previously on this blog, the 18 funerals from December to December can take a lot out of a parish, its congregations, and their pastor. Add to this a number of marital situations, life changing events (like having to be put in a nursing home or being diagnosed with cancer or a terminal disease) and the pastor can feel how much love can cost. These are my parishoners, my congregational members, they are also loved friends and family. While I cannot recuse myself, I find great comfort that my love isn't what counts for them. What counts is the Love Christ showed for them by living without sin and dying horribly and painfully in their (our) place on the cross. Even through this valley of the shadow of death, I shall fear no evil, for God has comforted me. For all of us we have the blessed certainty that this life is not the end, but merely a short time during which we are taught to appreciate the gift of God given to us in Christ. I wouldn't trade my vocation for anything right now. I don't have the right words all the time. I can be a stupid jerk in the kinds of questions I ask. And I can be an awkward fool in the way that I try to explain or discuss things with my members. But God has loved them so much that He gave His Onlybegotten Son to die for them. That's what counts. That's real love. We have a cold virus that has done some ugly things to a couple of our kids. This first photo is nice. 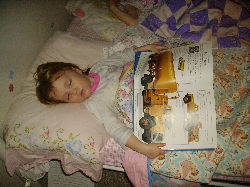 Stella fell asleep "reading" a book on trucks. There's not enough detail in the photo to see what's going on with her cold. 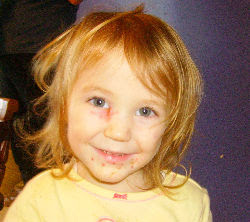 This particular cold has cause her to have cold sores on her face, by her eye, and in her mouth. Really, except for the smile, she looks like she's coming down with smallpox. But she's not. Mary has been away from Church for the past two weeks with sick kids. Stella is starting to improve quite a bit. But I had to make some mittens out of socks and duck tape them to her wrists so she wouldn't scratch her cold-sores----especially by her eye. The doctor says it's nothing to worry about. And he's a father too. I got a good photo of Mary reading to the kids one evening this week. Only Stella and Matthew are not in this photo. Stella was probably putting some toy in the toilet. Matthew was probably sitting in a chair reading "Popular Mechanics." Over the past 2 weeks I've had a number of pastoral visits and serious situations with a few families in our parish. We have a member, Rodney, who went through his examination after colon cancer and was declared free of cancer. Thank God. We've had a member, Muriel, who has had to have her husband moved into a "memory" wing of a nursing home. Please keep them in your prayers. We've had a young man and his children return to church after a long absence and a difficult year of struggle, thank God. We've had a member be diagnosed with cancer, but it appears to be a very treatable kind of cancer, thank God. And I've tried to keep up on the shut-ins in the past couple of weeks. Today I visited shut-ins up by St. Petri. Jimmy, I saw you at the Grygla corner. The hay looked like it was tied down tight on your trailer! I've received a few wonderful emails since Yvonne's funeral. I hope to be able to answer them in the next few days, for those who wrote, and for those I met in TR and elsewhere, I hope to answer you soon. Quite a lot has happened in the past couple of weeks. Honestly, I haven't really had time to sit down and type up an entry to this blog. It does require some planning and thought to write out these entries. 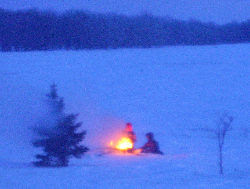 Matt and Clara went out to burn the Christmas wrappings in our fire pit. They like fire. I like fire. Fire can be fun. And they both know how to have fun with it safely. But ever since we've come home, Stella has been putting things (combs, hair bobs, toys) into the main toilet. Arrrgh! We aren't there at the time she does it. But fortunately, so far, the older kids have noticed before they use the toilet and we can extract them (I pull them out with my hands). I've got an ice-cream bucket that I'm filling with these things. We've had a number of wonderful foggy mornings that have given us beautiful hoar frost on everything. In general the temperatures have been nice, between 10 below and 20 above. Though, we did have a day and a half above freezing. No, I didn't have the time to clean all the snow out of the driveway during the defrost. Yes, we now have extremely hard snow and ice in our driveway. I found a deal on Cornish game hens at the grocery store. I haven't had one in about 5 years, so I thought I'd get 6 for our family and try cooking them. They were a hit, but 6 was too many. 3 would have been enough for a meal. It was a tasty experiment. But I'm done with 1/2 grown chickens. If they are on sale again I might get them, but the bones are too small and too much trouble to deal with for our toddlers. It's like serving fish that hasn't been de-boned. When I serve fish I make sure there are fillets that have no bones in them so we don't have to manage too much with the little ones. 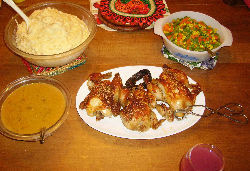 But the Cornish game hens are a bit too boney to do this easily. And Matthew, what can I say. He loves his stocking cap. He wears it all the time. His stocking cap stinks, we try to get him to put it in the wash. But it is always on his head. Of course, I make him take it off for meals. 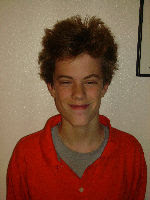 Here's what he looks like with it off. 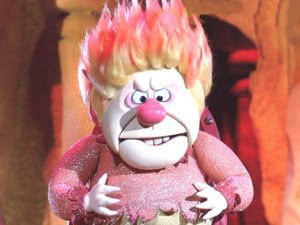 I'm reminded of Mr. Heat Miser in the "Year without a Santa." Happy New Year's Day. It's time to go home! 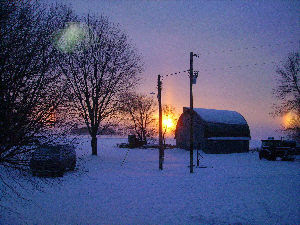 We were greeted with hoar frost and sun dogs this morning. We were a bit worried about the wind and weather, but the traveling looks fine. We took a more traveled route home. It took a bit longer. We fueled up at Glenwood and ate at Alexandria. 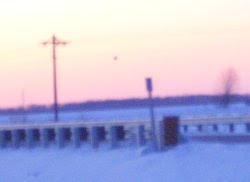 Some of the kids wanted to stop at the hunting store by Parkers Prairie, but it was closed on New Year's day. Waking up to travel was a bit difficult for a couple of the kids. I think this photo of Stella captures the sentiment pretty well. We were glad to get home: all cozy, nestled in our own warm beds. But, by accident, we had left the furnace too cold. It took a little while to warm the house up. But I'm sure that the savings in fuel while we were gone more than made up for it.